ESPN has found the man to replace Mike Tirico on "Monday Night Football." Sean McDonough has been named the new play-by-play announcer for ESPN's flagship football broadcast, "Monday Night Football," the network announced on Monday. 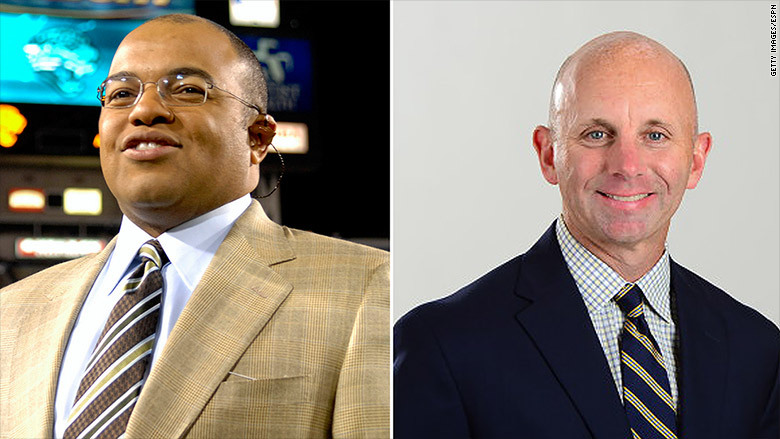 McDonough replaces Tirico who had called "MNF" games since 2006. The news comes less than an hour after NBC Sports officially announced what had been widely expected -- that he was joining the peacock network. Tirico starts July 1 and will be covering an "array of high-profile properties" including "Sunday Night Football" and the Rio summer Olympics, according to NBC. Tirico said in a conference call with reporters that the chance to cover the Olympics was at the "top of his list" for making the move. McDonough's move to replace Tirico on "MNF" was also anticipated. McDonough has been with ESPN since 2000 and covers college football, college basketball, and Major League Baseball. He signed a contract extension with ESPN earlier this year. McDonough will make his MNF debut alongside analyst Jon Gruden and reporter Lisa Salters at the Hall of Fame game on August 7. "This is a dream come true," McDonough said in a statement. "One of my favorite memories of my childhood was watching 'Monday Night Football' with my Dad, who I know is smiling down on me today." Tirico's move to NBC ends one of the longest tenures at ESPN. The sportscaster, who will remain at the network through the end of June, joined ESPN in 1991.